During my 2001 trip to Vancouver, Canada, I made a short detour south to Seattle. 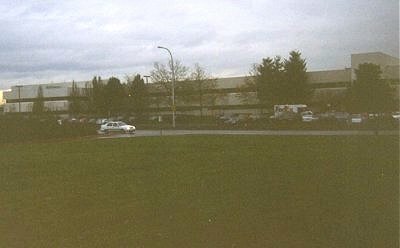 Near Seattle lies the city of Renton - home to Wizards of the Coast, the current maker of the Dungeons and Dragons game. 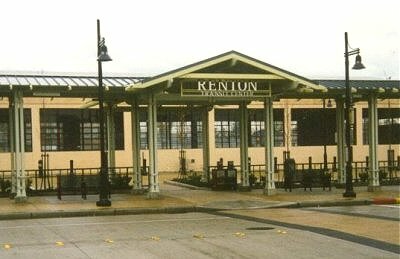 The picture above shows the Renton Transit Center, a bus station I visited on my way to the current D&D headquarters. Unlike small peaceful, backwater Lake Geneva, Renton is a sizeable city on the outskirts of the Seattle area which is home to millions of people. Wizards has a vast sprawling building, far larger than the TSR building I visited in 1989. D&D is only one of their many game related product lines. 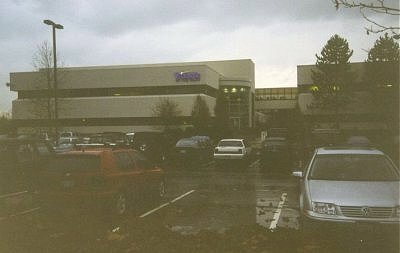 They are located along a very busy main road, not far from other large, sprawling office complexes of similar apparance such as those owned by Boeing. Part of the above complex. The purple logo says "Wizards" and the glass wall to the right of the logo reveals a staircase and a huge model red dragon! I did not ask for, nor was I given, a tour of this building. I did not even go inside. I was simply too pressed for time and money at that point to stay for more than a few minutes.